Icons in Custom Columns. Now you can create your own columns and have them display icons of your choice. E.g. 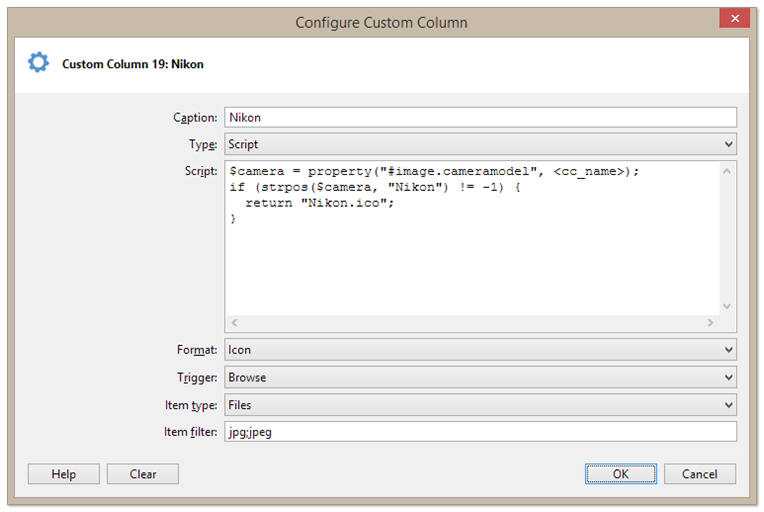 you could create a column that shows a special camera icon for all photos that were shot with a Nikon. Make stand out what’s important to you, and do it in a way that works best for you and your eyes. Nikon shots are clearly marked by the black camera icon. 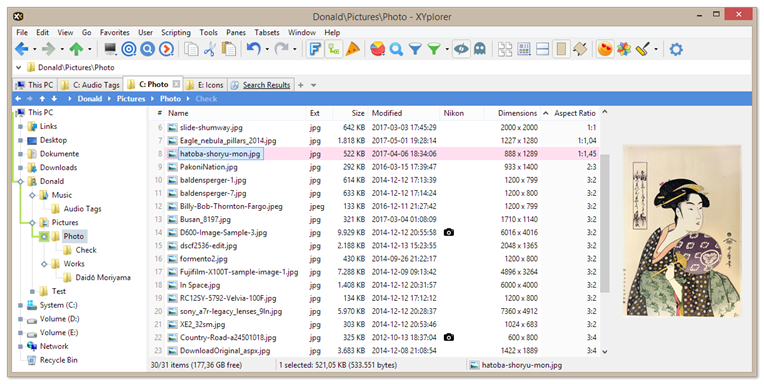 How to do it: First select an icon (any *.ico file), call it "Nikon.ico", and place it in the "Icons" folder under XYplorer’s app data folder. It could be anywhere else but this is the default path for Custom Column icons. It makes the scripting easier, more readable, and also portable. 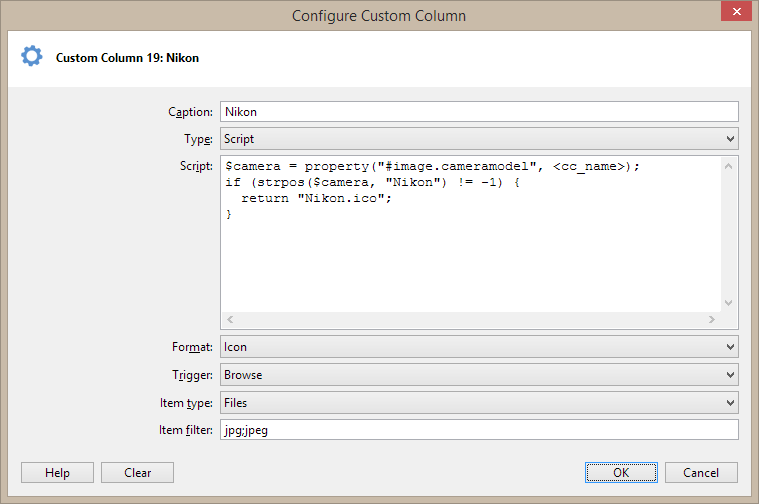 Now create a new Custom Column (Configuration | Custom Columns | Custom column definitions), set the caption to "Nikon", set the column type to "Script", and the column format to "Icon". Set the item filter to "jpg;jpeg". This will limit the job to JPEG files (we want speed). Now add a new column to your list (View | Columns | Add Column), right-click the column header (still named "(Undefined)"), and click "Select Custom Column..." in the popup menu. Now from the list select "Nikon, Script (jpg;jpeg)" and press OK.
Now the icon should appear for all JPEG files that were shot with a Nikon. Circles in Custom Columns. Now you can decorate your files with colorful circles. Brings back a long-missed psychedelic kindergarten vibe to file management. Now it’s your turn to design cute circles and give them some meaning. Check out the Help file under Custom Columns for the syntax of the draw.circle command. Scroll Margin. Introducing a smart little usability enhancer that gives some context to your cursor when moving up or down the list with the arrow keys. Lets you see where you are going before you go there. Relaxing. This one is for typers. First set your preferred scroll margin at Configuration | Menus, Mouse, Safety | Usability | Scroll margin. A nice value is 2. The setting affects keys Up, Down, PageUp, and PageDown in Tree and List when there is a vertical scrollbar. It also controls where the focused item is positioned when you do Ctrl+Dbl-Click on white space (= Scroll focused item into view) in Tree or List.